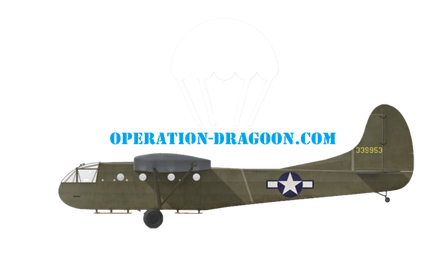 The WACO CG-4A Invasion Glider : - Site de operationdragoon ! 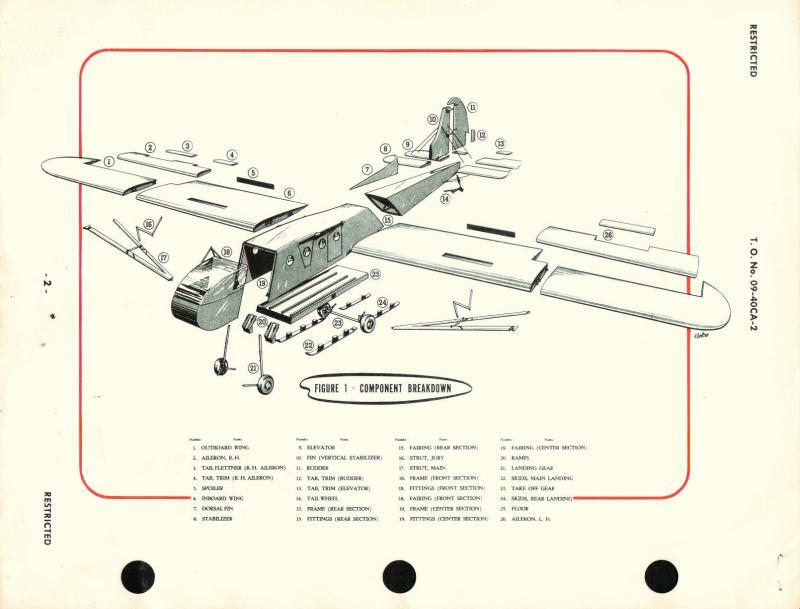 Army development of troop-carrying gliders began in 1941, with experimental contracts for a series of prototypes to meet two separate specifications. 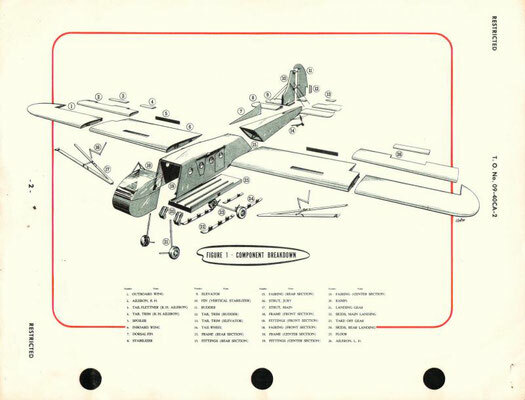 The first requirement was for an 8-9 seat transport, and contracts were placed for single prototypes of the Frankfort Model TCC-41 as the XCG-1 ,the Waco NYQ-3 as XCG-3 ,the St. Louis XCG-5 and the Bowlus XCG-7. The second type was to be a larger, 15-seat glider, and the same four companies each received contracts for a single prototype of this type as follows: Frankfort TCC-21 as XCG-2 (41-29616); Waco XCG-4 (41-29618); St. Louis XCG-6 (41-29620) and the Bowlus XCG-8 (41-29622). Of the eight prototypes ordered, all but the XCG-1, XCG-2 and XCG-6 were completed and test-flown but no further development of the St. Louis or Bowlus designs occurred, only the two Waco types reaching quantity production. The CG-4 became the first and most-widely used US. troop glider of World War II. 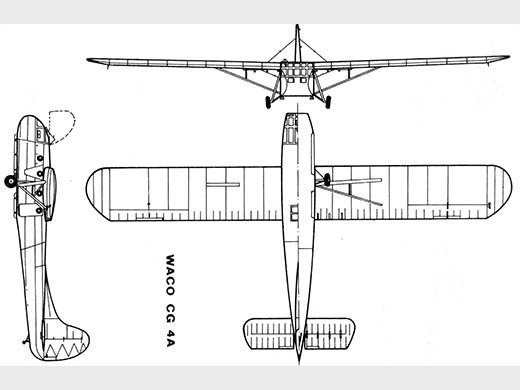 Of mixed wood and metal construction, fabric covered, the CG-4A was of conventional troop-glider design, with a high wing, a box-section fuselage and an upward-hinged nose section to permit direct loading of vehicles from the front. The cockpit was equiped with its dual control for a pilot and a co-pilot side-by-side, and the tow attachment. As required by the specification, the CG-4A could accommodate I3 equipped troops. Among other tactical loads which could be carried were a standard Army Jeep, with four men crew, or a 75-mm. pack howitzer and crew, a jeep trailer loaded, a CA1 Clark Airborne miniDozer. Its gross weight of 7,500 lb.-9,000 lb. and towing speed of 150 m.p.h. made it suitable for operations behind the C-46 and C-47. Companies which were included in the CG-4A program, and the numbers built by each, were as follows: Babcock, 60/ Cessna. 750/ Commonwealth, 1,470/Ford, 4,190/G. and A. Aircraft, 627/ General. 1,112/ Gibson Refrigerator, 1,078/Laister-Kaufman, 310/ National, 1/ Northwestern, 1,510/ Pratt & Read, 956/ Ridgefield Manufacturing, 156/Robertson, 170/ Timm, 434/ Ward Furniture Co., 7, and Waco built 1,075. Included in these totals are four airframes converted to other configurations, as noted below. 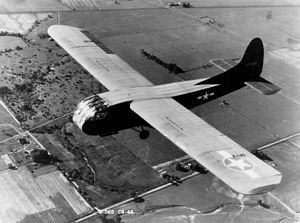 The CG-4A Glider went into operation in the Allied invasion of Sicily in July 1943. Greater success attended their participation, in March, 1944, in the second Wingate Chindit operation in Burma, involving landing in a jungle clearing by night ISO miles behind the main Japanese lines. Subsequently these gliders participated in other major airborne operations of which the most significant were the D-Day landings in France on June 6,1944, in Normandy, the second D-day, landings in southern France on the 15th of August 1944, the action at Arnhem september 44 and the crossing of the Rhine 1945. Le planeur Américain Waco CG-4 fut le planeur militaire le plus utilisé lors de la Seconde Guerre mondiale. Les essais en vol commencèrent en mai 1942. Par la suite, environ de 13 900 CG-4A furent construits. Le modèle définitif retenu par l’armée fut celui du constructeur aéronautique société Weaver Aircraft Company of Ohio, d’où les initiales WACO. Les besoins de l’armée etant importants, ce sera au total 16 Usines dans tous les état Unis qui construira en plus ou moins grande quantité ce planeur les couts variaient suivant le fabricant entre 14000 à plus de 1million de dollars. 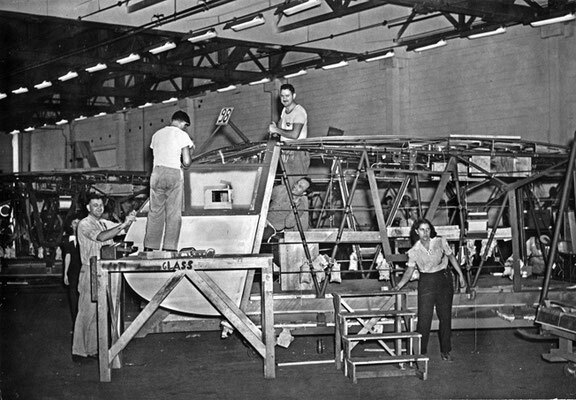 Cessna Aircraft Company of Wichita, Kansas (750) The entire order was subcontracted to Boeing Aircraft Company's new Wichita plant. * Surface alaire : 83,60m². * Masse à vide: 1 719kg. * Charge maxi : entre 3 400 et 4000. Le CG-4 était construit en tubulure de métal et bois contre plaqué recouvert de toile. L’équipage se composait d’un pilote et d’un copilote. Il pouvait transporter 12 ou 13 soldats équipés ou une Jeep ou encore un canon aéroporté de 75 mm. Pour le remorquage ce fut l’avion de transport Dakota C47 qui fut le plus utilisé. Les CG-4A opérèrent en juillet 1943 durant l’invasion de la Sicile (Opération Ladbroke). Ils participèrent aussi aux missions Albany et Boston lors du débarquement Allié en Normandie (Opération Neptune) le 6 juin 1944 en soutiens et en renfort des parachutistes des 82e et 101e divisions. Après le débarquement de Normandie, ce sera donc en Provence que ces « Ailes silencieuses » vont atterrir le 15 aout 1944 sur 2 zones bien définies. La Zone A : Entre Trans en Provence , Les Arcs et La Motte. Et la Zone 0 : entre la Motte, Le Mitan et La nationale 7. Au Total environ 390 planeurs seront utilisés lors de la bataille de Provence permettant d’apporter du matériel lourd aux parachutistes largués à l’aube sur ces Zones et prés de 3000 hommes.